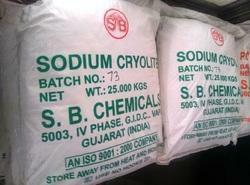 We are one of the major producers of Industrial Cryolite in India. We have specialized equipment to manufacture and cater to the needs for manufacturing 125 MT of synthetic cryolite per month. It used for various applications such as, as an electrolyte in production of aluminium smelters, used as an active ingredient in flux manufacturing, used in speciality glass industries. It is also used in abrasive grinding wheel manufacturing and speciality concretes. It finds applications in all steel and foundry application apart from manufacturing exothermic sleeves and tundish. Our cryolite has negligible silica content with very low moisture, around 0.05% at 180 degree C.
We are one of the leading Potassium Cryolite manufacturer and supplier and appreciated for offering it that is widely used in foundry flux chemicals, for manufacturing of welding fluxes etc. It is available in purity of 98%. It is commonly traded as Potassium Aluminium Fluoride. 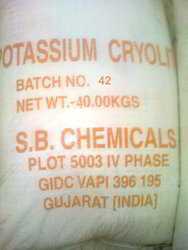 Potassium cryolite is used as active filler in resinbonded abrasives for metal treatment. It is also used for pyrotechnics. One of the major uses though is as components in coatings of welding rods and welding powders. Sodium Cryolite salts are used as solvent for bauxite in the electrolytic production of aluminum; other metallurgical applications such as foundry additives for aluminum foundry, sleeves, cover flux; filler for bonded abrasives glass and enamel industries; in the manufacture of insecticides.